Dietes is a genus of rhizomatous plants of the family Iridaceae. Common names include Fortnight lily, African iris, Morea or Moraea iris, Japanese iris and Butterfly iris, each of which may be used differently in different regions for one or more of the four species within the genus. Most species are native to southern Africa, with one (Dietes robinsoniana) native to Lord Howe Island off the coast of Australia. The genus name is derived from the Greek words di-, meaning "two", and etes, meaning "affinities". 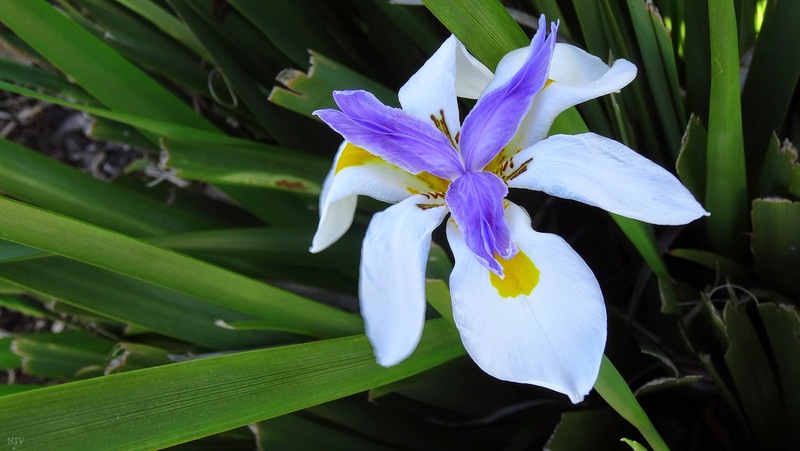 The photo below is showing Dietes grandiflora, a common garden plant in Australia, often seen in mass plantings on road reserves and traffic island plantations. Aquilegia (common names: Granny's Bonnet or Columbine) is a genus of about 60-70 species of perennial plants in the Ranunculaceae family, that are found in meadows, woodlands, and at higher altitudes throughout the Northern Hemisphere, known for the spurred petals of their flowers. Columbine is a hardy perennial, which propagates by seed. It will grow to a height of 30-60 cm. 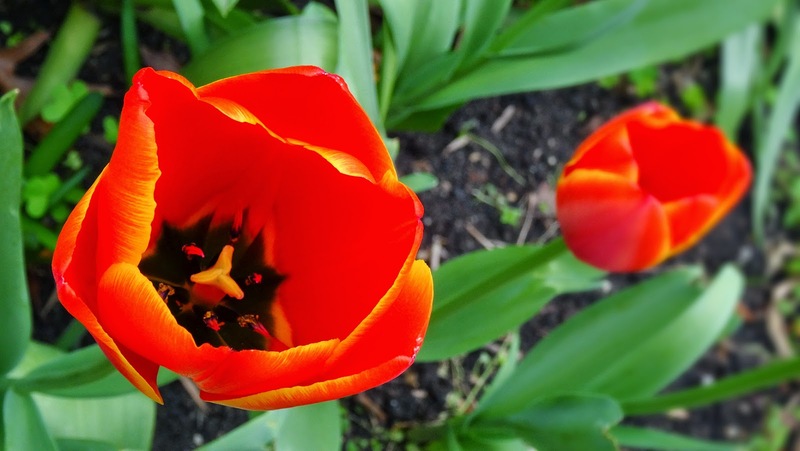 It will grow in full sun; however, it prefers growing in partial shade and well drained soil, and is able to tolerate average soils and dry soil conditions. 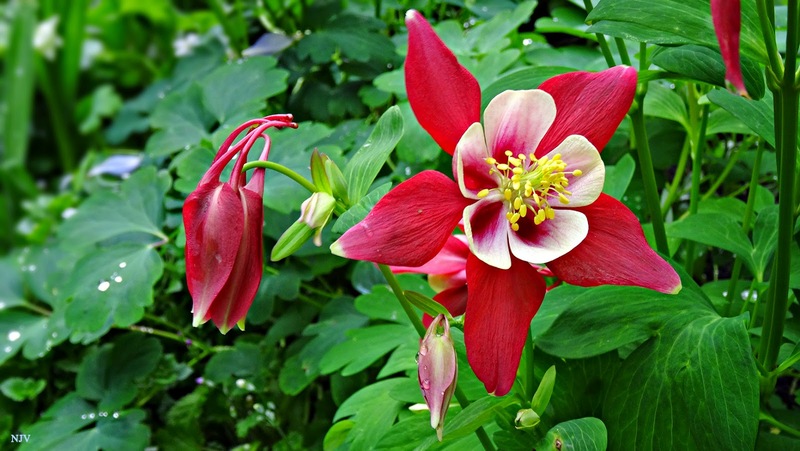 Columbine is rated at hardiness zone 3 in the USA so does not require mulching or protection in the winter. Large numbers of hybrids are available for the garden, since the British A. vulgaris was joined by other European and North American varieties. Aquilegia species are very interfertile, and will self-sow. Some varieties are short-lived so are better treated as biennials. Several hybrid cultivars have gained the Royal Horticultural Society's Award of Garden Merit. Commonly known as hellebores, members of the Eurasian genus Helleborus comprise approximately 20 species of herbaceous or evergreen perennial flowering plants in the family Ranunculaceae, within which it gave its name to the tribe of Helleboreae. The scientific name Helleborus derives from the Greek name for H. orientalis "helleboros"; "elein" to injure and "bora" food, referrign to the fact that many species are poisonous. Despite names such as "Winter Rose", "Christmas rose" and "Lenten rose", hellebores are not closely related to the rose family (Rosaceae). Hellebores are widely grown in gardens for decorative purposes. They are particularly valued by gardeners for their winter and early spring flowering period; the plants are surprisingly frost-resistant and many are evergreen. Also of value is their shade tolerance. Many species of hellebore have green or greenish-purple flowers and are of limited garden value, although Corsican hellebore (H. argutifolius), a robust plant with pale green, cup-shaped flowers and attractive leathery foliage, is widely grown. So is the 'stinking hellebore' or setterwort (H. foetidus), which has drooping clusters of small, pale green, bell-shaped flowers, often edged with maroon, which contrasts with its dark evergreen foliage. H. foetidus 'Wester Flisk', with red-flushed flowers and flower stalks, is becoming popular, as are more recent selections with golden-yellow foliage. The so-called Christmas rose (H. niger), a traditional cottage garden favourite, bears its pure white flowers (which often age to pink) in the depths of winter; large-flowered cultivars are available, as are pink-flowered and double-flowered selections. 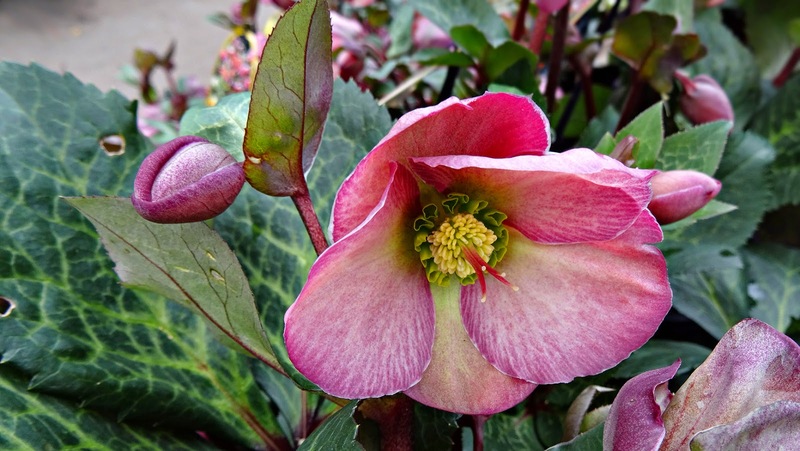 The most popular hellebores for garden use, however, are undoubtedly H. orientalis and its colourful hybrids (H. × hybridus). In the northern hemisphere, they flower in early spring, around the period of Lent, and are often known as Lenten hellebores, oriental hellebores, or Lenten roses. They are excellent for bringing early colour to shady herbaceous borders and areas between deciduous shrubs and under trees.